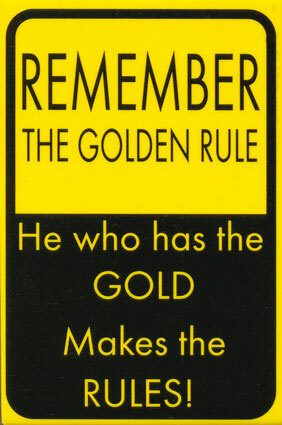 Do you remember the Golden Rule? We used to be taught it in school. It goes like this — “Do unto others as you would have them do unto you.” I heard that so much growing up. Treat others the way you want to be treated is a pretty amazing, a pretty profound bit of advice. Advice worth adhering too. Think about it. What if everyone followed the Golden Rule? What if everyone decided to heed its simple yet significant challenge? There would be no prejudice, no hate, no violence, no wars, no cheating, no lying, no stealing, no killing. Crimes would stop. Wars would cease. There would be peace. If… we all followed that one simple rule. One profound, incredible, totally simplistic, little rule — to treat others the way we’d like to be treated. In this world the Golden Rule has become antiquated to the point of being obsolete. There is a new rule, a rule opposite of the Golden Rule. It is rather a tarnished one. One that actually twists about the Golden Rule. The rule of the world today is “Do to others as they did to you.” Get even. Don’t let anyone treat you bad. If you do you are weak, cowardly and stupid. In the world’s terms, the one who doesn’t retaliate is a push over. So according to the world’s standards, Jesus Christ was a push over — a weakling that people could take advantage of. Jesus didn’t fight back. He didn’t do to others what others did to Him. When others didn’t appreciate or acknowledge the things He did for them, He didn’t pout and complain to His friends. When others lied about Him, He didn’t retaliate. When others mocked Him, He was silent. When others spat in His face, He kept His cool. When they beat Him, He stood quietly and took it. He didn’t have to get the last word in. Instead, He held His tongue. Then, after they hung Him on a splintery old cross to be ridiculed, publicly humiliated, tortured and killed, He forgave. And, by so doing, He overcame. Looking at the life of our Savior, the One who withdrew from the normal standards of life, withstood the trials and persecutions, and withheld the notions to get back at His persecutors, we see anything but weakness. We see the epitome of strength. We see someone who sacrificed Himself for the good of others. It is because of that sacrifice that we are not condemned to a fiery hell. It is because of His forgiveness, grace and mercy that we can find hope, joy and peace. Jesus dared to be different. He dared to do right. He dared to take a stand. By so doing, He made a difference. He overcame evil with good. He fulfilled the Golden Rule. Now if we were to apply the Golden Rule in our lives, one by one we could make a difference too. We could sow love where hate rules, peace where there is strife, kindness where there is malice, joy where there is sorrow. One by one we could plant the seeds that would change the world, if only we would dare to do so. This entry was posted in Self Improvement on February 15, 2014 by admin_z.